Another wonderful creation from the Garcia family, the Flor de las Antillas Natural and Maduro cigars pay homage to Cuba, the 'Flower of the Antilles,' and the island's rich cigar heritage. 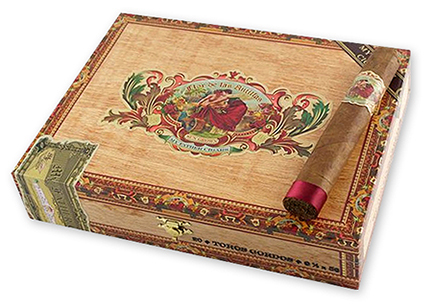 Hand rolled and box-pressed at My Father Cigars, the beautifully constructed Flor de las Antillas cigars are presented in a band and cigar box decorated with vintage artwork. The Flor de las Antillas Natural is somewhat milder and lighter on the spice than most cigars produced by My Father Cigars. A Nicaraguan puro blended with several Cuban seed tobaccos and wrapped in sun-grown leaf harvested from the Garcia's farm in Esteli, this well-balanced, medium-bodied cigar offers notes of coffee, cream, dark chocolate, nutmeg and a touch of white pepper. 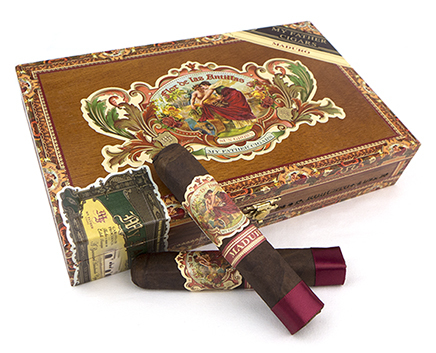 The Flor de las Antillas Maduro cigars are blended with the same Nicaraguan binder and fillers as the original "Natural" but wrapped in an undisclosed maduro leaf rather than the Nicaraguan sun-grown wrapper used for the original. The beautifully rolled, box pressed Maduro cigars are medium-bodied and flavorful with notes of leather, wood, earth, dark chocolate, nuttiness, espresso and cinnamon combining nicely with the raisin sweetness of the wrapper.